With warm temperatures finally here, most of us have stopped using our fireplaces for the season. Even if you aren’t currently using it, now may be the perfect time to have your chimney swept and serviced! Because spring is traditionally the off season for chimney sweeps, there are a number of benefits to having your chimney serviced now. Having your chimney swept now will leave it clean and ready to use again when fall arrives! During a chimney sweeping, a certified chimney sweep will remove any soot, ash, creosote, or debris from the chimney using special brooms and other tools. Removing creosote is extremely important; creosote is a naturally occurring byproduct of wood burning fires, but is also extremely flammable. Because of this, removing creosote can significantly reduce the risk of accidental chimney fire. Your annual chimney sweeping is also a good time to have your chimney inspected. Chimney inspections are important because they often help chimney sweeps identify small areas of damage before it turns into a major problem. During a chimney inspection, all accessible areas of the interior and exterior of the fireplace and chimney will be checked for signs of damage or deterioration. If any damage is found, your chimney sweep can recommend the appropriate repairs. 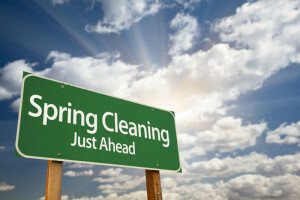 After a long winter of use, there is no better time to have your chimney cleaned then the spring! Below are a few benefits of spring chimney service. – Mild weather: Many chimney repairs cannot be completed if the weather is too hot or too cold. Spring’s mild temperatures are ideally suited for many masonry repairs. – No impact on use: In the fall or winter, waiting for an appointment can impact using your fireplace when you really need it. By having your chimney serviced now, it will be ready to go when the weather cools off in the fall. – Available appointments: Because spring is the off season for the chimney industry, it is easier to get an appointment at a time that is convenient for you. – Shorter wait times: Along with more convenient appointment times, scheduling during the spring often means shorter wait times before services. This can be especially appointment if the chimney is damaged and needs immediate repairs. With short wait times for appointments and mild weather, spring is the perfect time of year for chimney maintenance! Contact Magic Broom Chimney Sweeps today to schedule your spring chimney services.